The decoration of the katholikon with the exception of the sanctuary (which is about 80 years older) was completed at 8th November 1552. The ample lite which has four columns and nine cross-vaults is very well illustrated. The west, north and south wall as well as the ceiling cross-vaults are covered with martyrdoms of Saints. In a shallow niche on the southwest end of the south wall are depicted full-bodied the two founders of the monastery before their grave wearing monastic frooks and holding, as usual, a model of the church they erected. In a small niche on the east wall on the left of the main entrance towards the nave there is St. John the Baptist and in another niche on the right the Baptism of the Christ. On this wall above the main entrance one can see the Deesis with our Lord in the middle flanked by Virgin Mary and St. John the Baptist. 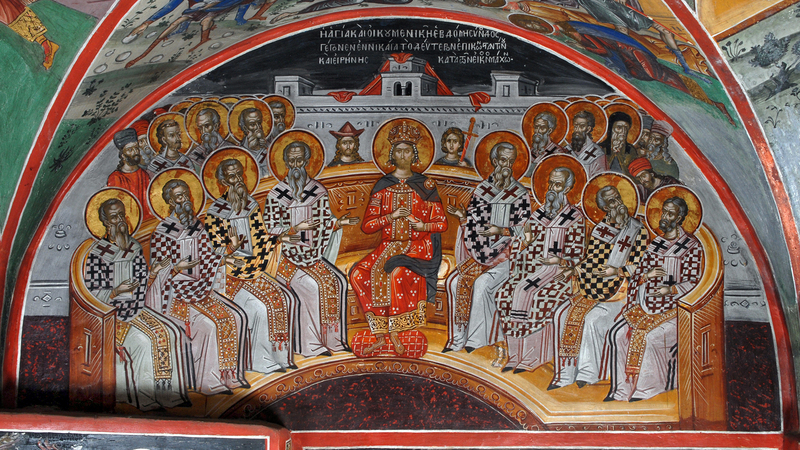 On the northeast end the first Ecumenical Synod of Nicea is depicted while on the southeast end the 7th Ecumenical Synod. 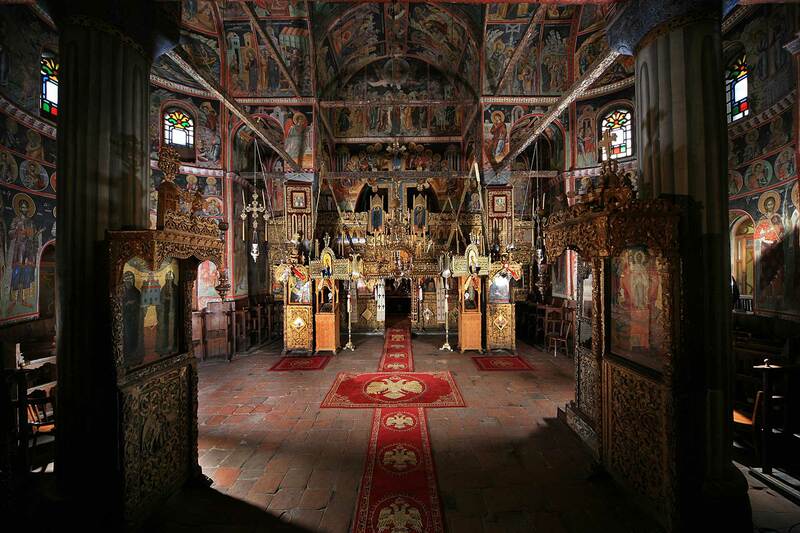 On the lower register are represented great figures of ascetism, as well as the great composers of hymns (melodoi) of our church Ioannis Damaskinos and Kosmas the poet. The nave is exquisitely illustrated too. 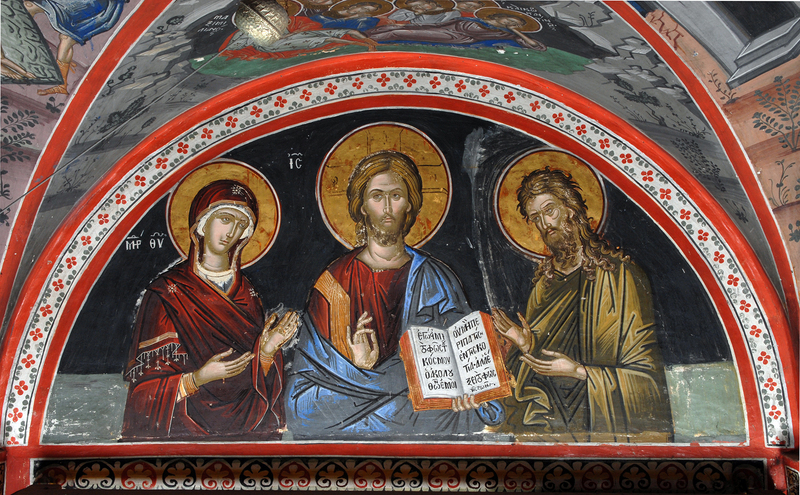 On the dome Jesus Christ Pantokrator the All-Mighty and All-Seeing dominates with its position and magnitude surrounded by angelic ghosts as a chorus of honor. In the tympanum of the dome between the windows are the full-bodied figures of the prophets holding rotuli containing predictions which announce the coming of the Savior. On the pententives there are the four Evangelists. On the lower register of the west wall as well as the west part of the north and south wall there are full-bodied figures of great saints, ascetes-anchorites. On the south pilaster of the west wall is depicted full-bodied in his monastic frock, holding a cross in his right hand and a rotulus in the left, the founder of the monastery Saint Athanasios. On the north pilaster in an equivalent position Saint Ioasaph is depicted in the same way, holding in his right hand a model of the katholikon of the monastery he built. On the lower register of the choirs there are full-bodied military saints. High up on the three walls (west, north, south) there are two narrow zones with busts of saints. Above the main entrance and the inscription of the west wall there is the “Anapeson”. The rest of the upper faces of the walls, as well as the arches- the arms of the cross are covered by the large iconographic cycle of the Despotic feasts and the Feasts of Virgin Mary, the miracles of our Lord etc. The excellent painter of this assemblage of wall-paintings preferred to retain his anonymity. Yet on the basis of some distinctive features in the manner of his work we may attribute the illustration to certain painters of ateliers. 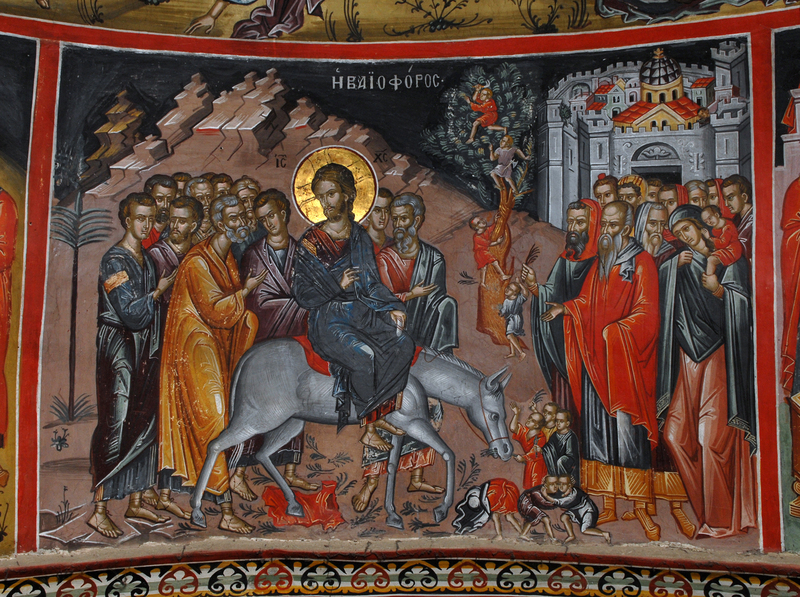 Thus, these wall-paintings are attributed to the great Cretan painter Theophanis or to his pupil’s atelier or finally to the painter of the Monastery of Dousikon (St. Vissarion) who is Giorgis. 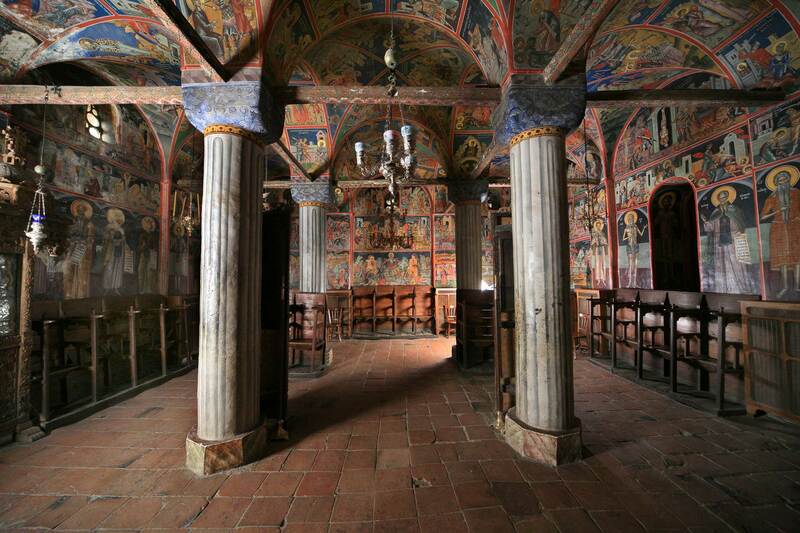 The sanctuary was painted in1483 and it was the then katholikon of the monastery. This is the reason it has the form of a small independent church which belongs to the type of the two columned cruciform inscribed with a dome. 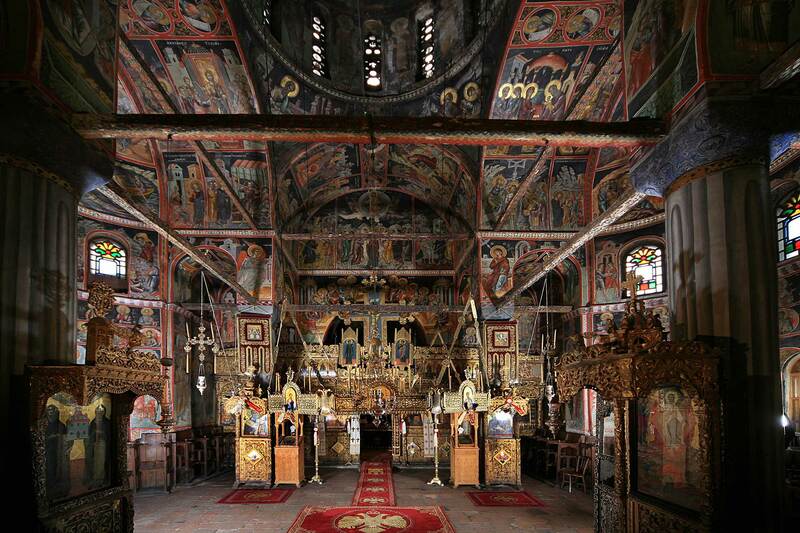 So its wall-paintings covers thematically all the hagiographic and dogmatic cycle of a proper church. On the dome is represented Christ the All-Mighty surrounded by angelic chorus. 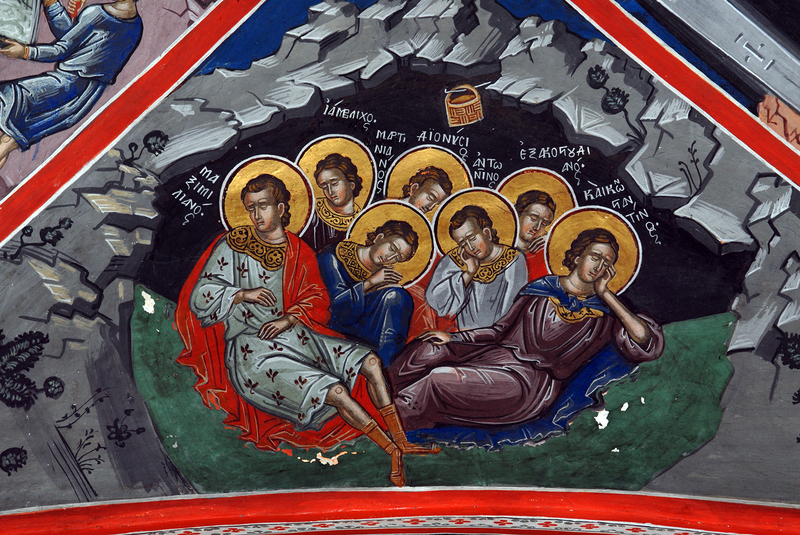 On the pendentives the four Evangelists while on the lower register of the apse there are full-bodied fathers of our church and hierarchs. On the upper register of the sanctuary apse is illustrated the Holy Communion, the Eucharist, according to the usual iconographic type and on the top of the apse Virgin Mary on the throne flanked by two angels holding fans. 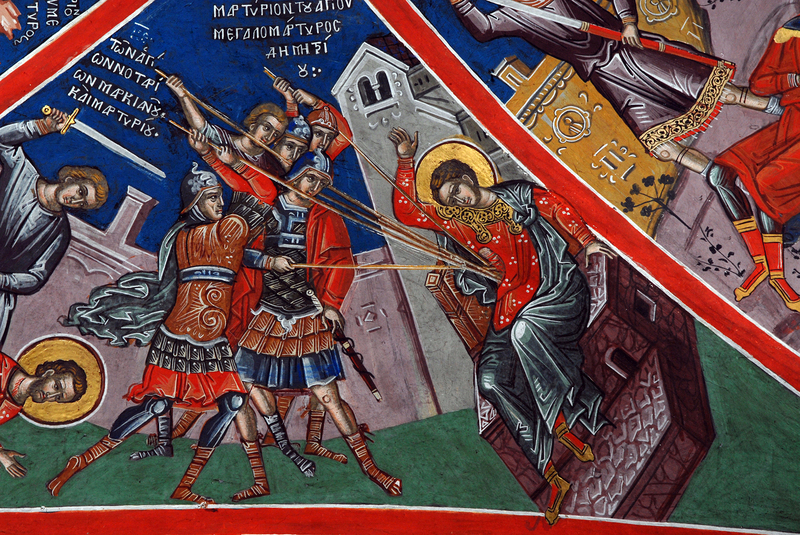 The rest of the walls (the lower zone) is illustrated with military saints and ascetes. On the narrower zone right above there are busts of saints. On the south and north column of the west wall are represented the founders of the monastery Saint Athanasios and Saint Ioasaph. 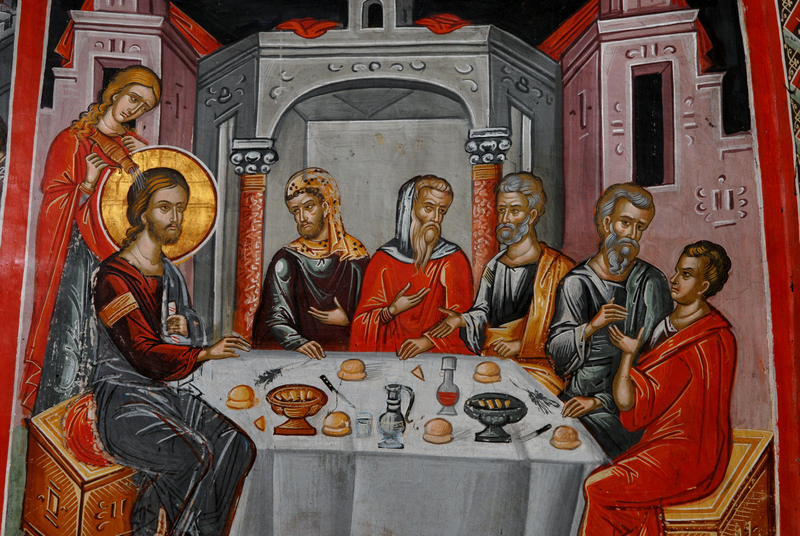 On the rest of the surfaces are represented scenes from the Dodecaorton as well as our Lord’s Passion. 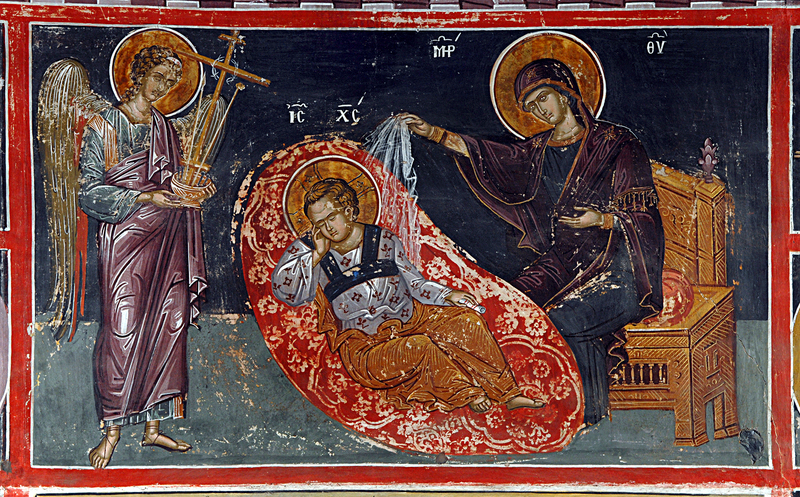 On the south column of the east wall is represented the Mother of God the Paraklesis and on the north column St. Nicholaos the warm protector. 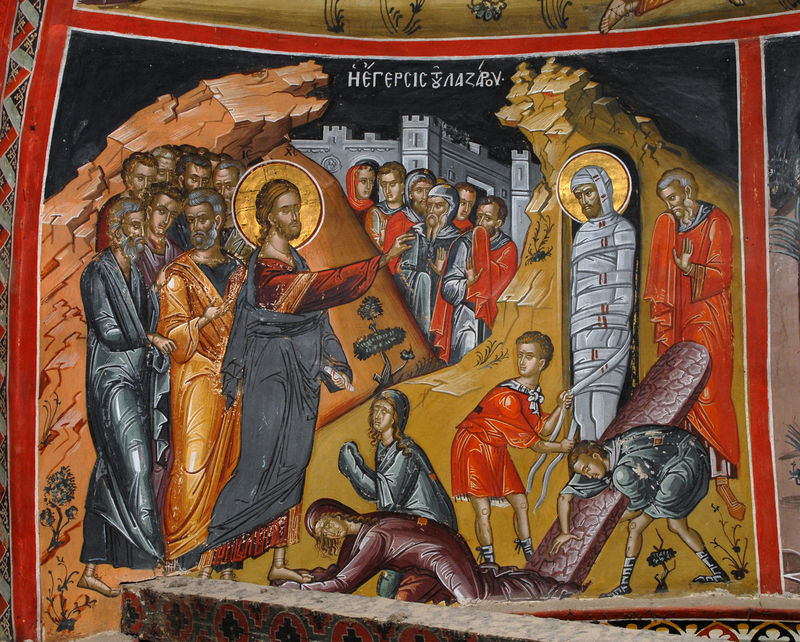 On the old closed entrance of the original church, on the present outer narthex there are wall – paintings as well. High up in the apse the Enthroned Christ flanked by two small angels on the upper edges of the throne. Out of the apse on the left and right accordingly Virgin Mary and St. John the Baptist supplicate for the salvation of the world. Below, a folk illustration representing the patriarchs in paradise sitting on stools, and around a schematic representation of trees and flowers.